Zildjian has designed a drum rack based on designs similar to those used in machine equipment and airframe design. This rack is both lighter and stronger than conventional steel drum racks, and perfect for both acoustic and electric percussion setups. The acoustic / electric AE Rack System is designed around a patented hinge system that enables it to be quickly folded for ease of setup and transport. The rack includes a cable channel that allows the user to feed up to 12 XLR cables through both the vertical and horizontal bars, thereby providing a complete cable management system that conceals and protects important cabling. Each AE Rack System includes 6 patent-pending glass filled ABS multi-clamps. 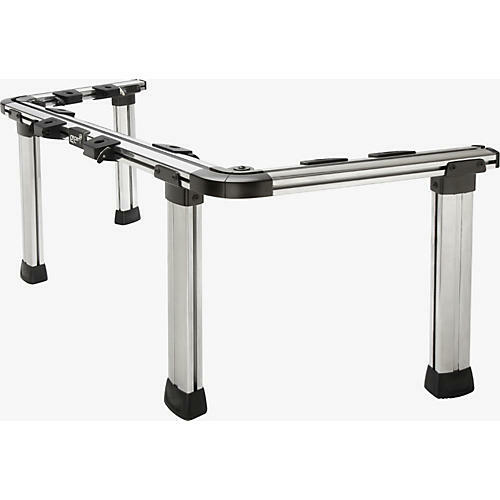 The AE Rack Multi-Clamp fits most manufacturer's mounting accessories ranging from 3/8" to 3/4" in diameter and can be positioned on either side of the bar with an easy and solid one-touch tightening mechanism. Fits up to 20" Bass Drum.